Would you like a single report that summarizes availability and all outstanding issues? Halcyon now ships with a “System Summary Status Report” that can be run either manually or scheduled by using the Halcyon Advanced Job Scheduler or IBM Scheduler. List of all open Halcyon Alerts List of scheduled entries as defined in the IBM standard scheduler. 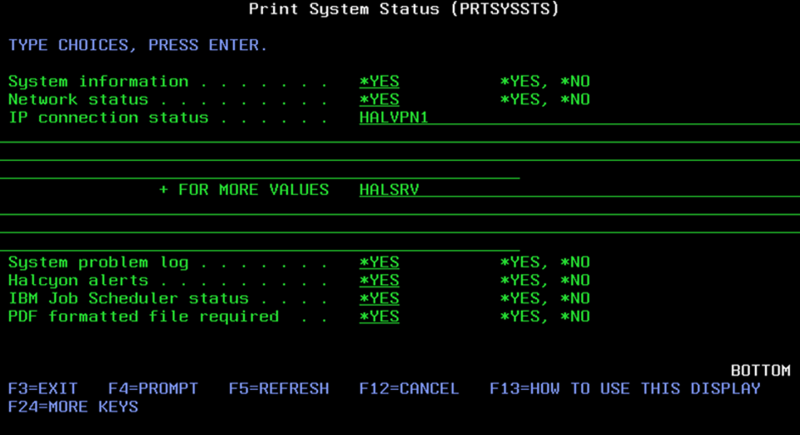 The report can be run by using the HALPROD/PRTSYSSTS command and when used in conjunction with Halcyon’s Output Queue Monitor can be automatically emailed to you each run. Here’s a sample showing two extracts from the report summarizing the System ASP and the Problem Log. To automate the distribution of this report simply create a Rule to look for the creation of the ‘PRTSYSSTS’ spooled file. Pair this with the SNDTXT Action to have the report automatically emailed out.